My desert island food is corned beef. Hot, piled up on a sandwich, between two pieces of rye bread with spicy brown mustard smeared liberally inside, corned beef is the one food that I could find myself being happily enjoying if trapped on a desert island. (With unlimited ice-cold pitchers of tropical cocktails, of course.) I also want cole slaw and half-sour pickles, too. Although if truth be told, I’m okay with just fat slices of corned beef, warmed, served on their own. 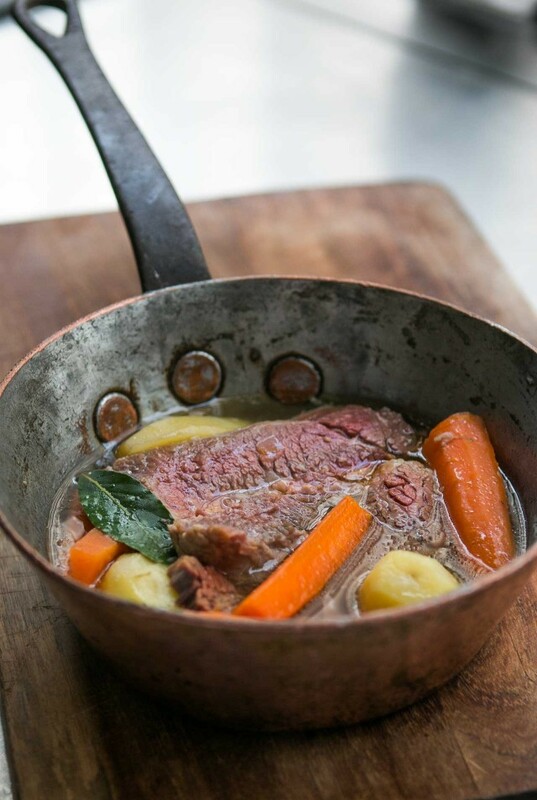 Or simmering in a pot with potatoes and carrots with a bottle of French wine alongside. Many French people know pastrami, but don’t know corned beef as most of us know it. (What they get is a canned version, which looks from photographs to be closer to Spam than to actual corned beef.) Romain can’t seem to get enough pastrami and once we went to a not-so-good restaurant in Paris where I’d heard they had it on the menu. When he was served two slices of bread with only two meager, thin slices of pastrami hidden in between, he walked back into the kitchen with his sandwich in hand and told them it needed to be really, really thick. I couldn’t hear what he was saying, but he was demonstrating how thick it needed to be with his hands to the astonished cooks. Growing up in New England, my mother sometimes made a boiled dinner of corned beef with cabbage, potatoes and carrots. I can’t say I was a big fan of the cabbage and it wasn’t until recently that I learned that it’s actually called a New England boiled dinner, but the potatoes and carrots were great along with slices of the moist, pink meat always served with a dollop of spicy brown mustard alongside. When delis were more plentiful in New York City, back then, I’d look forward to our visits to get one of those loaded-up sandwiches stacked ridiculously high. A friend who grew up not far from me, recently told me that you’re supposed to order an extra piece of bread, pull out some of the meat, and eat a “normal-sized” sandwich – then take the rest home to make another one. I didn’t know that. I always ate the whole thing. Gulp. Part of the affection for pastrami is that it has somewhat of an iconic status, and the vowel-ending word rolls off the French tongue easier than the hard consonant-ending, “corned beef.” But the other part is that “to corn” is a verb that doesn’t exist in the French vocabulary. (The word “corn” originally referred to the large grains of salt that is used for salting the meat.) The verb maïser, or “to corn,” hasn’t been added to the French verb dictionary, yet. While lunching with my chef pal over lunch, he mentioned that he could get brisket in Paris. Huh? That was news to me, and others who’ve sent me quite a few messages from people over the years looking for brisket-cut meat in France. French butchers cut meat differently than their American counterparts and an American woman who has lived in Paris since the ’50s showed me some recipes and notes she had collected over the years, which probably answer the question – in words and pictures – what cut of meat brisket is, in French. Feel free to show the picture above to your local butcher in France, in the future. 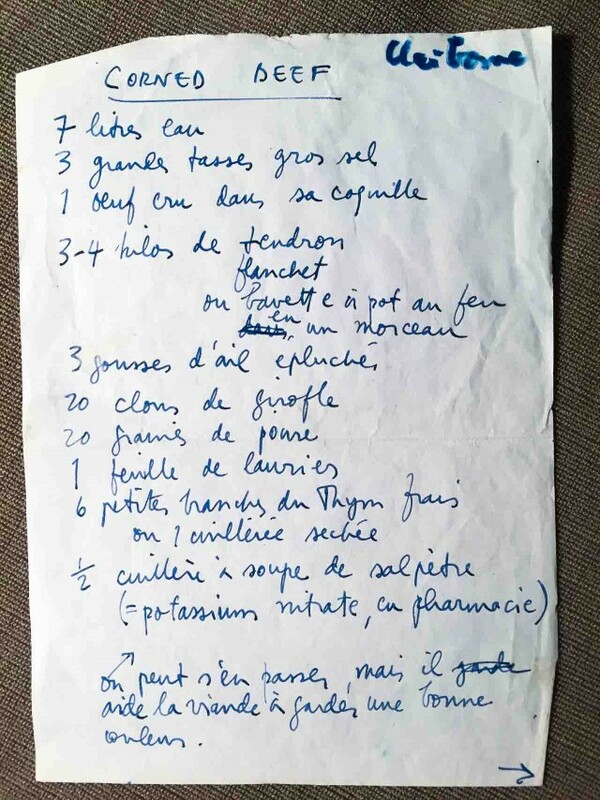 She also had a handwritten recipe for corned beef, which curiously called for “1 œuf cru dans sa coquille,” or “a raw egg still in its shell.” I figured it was a way to test the brine for salinity, which Michael Ruhlman, author of several books on curing meat, agreed with. I also read about a new-fangled way to “bake” corned beef*, which looked and sounded interesting, until I read the words “too salty,” from people who’ve made it. I’m sort of a traditionalist about corned beef and don’t mind boiling mine. And did have fun brining my own from scratch. My curing salt was from G. Detou in Paris, and I went to my local market to buy carrots and potatoes. Fortunately, someone had given me a branch of bay leaves from their tree, and once my brined brisket was ready, I was on my way to my own New England boiled dinner. 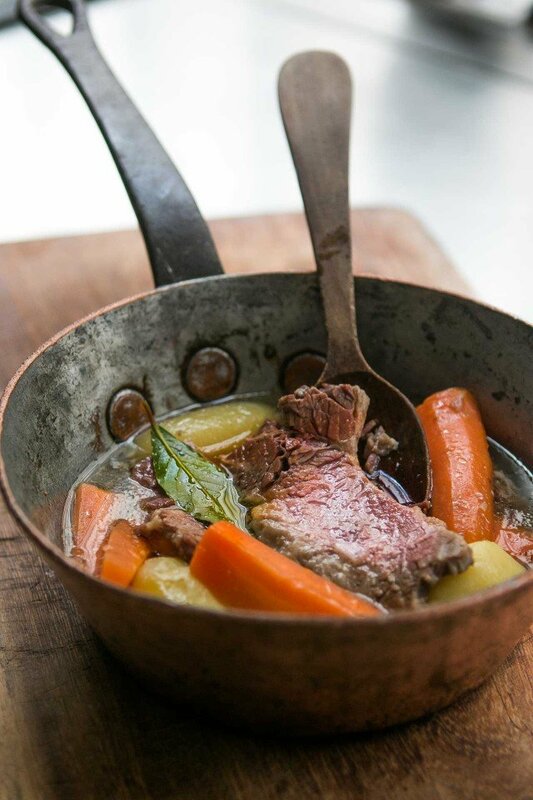 I served this to French friends, who loved it, and told me it reminded them of Pot-au-feu, a traditional boiled beef dinner served with mustard, coarse salt, and sometimes horseradish. I was fortunate to have leftovers the next day but until I find New York-style rye bread with caraway seeds in it, in Paris, I’ll be eating my corned beef in bouillon, rather than en sandwich. If you’re a fan of cooked cabbage, you could add some green cabbage wedges along with the potatoes and carrots to the bouillon. And although not traditional where I come from, there’s no reason why you can’t sneak some other root vegetables in the broth, such as turnips or rutabagas, like they do in French Pot-au-feu. 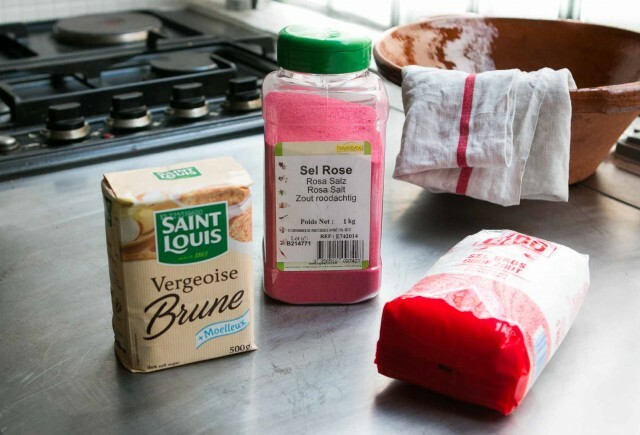 Just make sure to cut them about the same size as the other vegetables so they cook for the same time.The pink curing salt is not required but does give corned beef its traditional red color. You can omit it, if you’d like, being aware that the corned beef will be brown, rather than pink. There is a link in the post to someone who used beet juice to color the meat. If you want to use the curing salt (sometimes called Prague Salt), you can find it at Amazon, Butcher Packer or at stores that sell spices and seasonings. Note that Pink Himalayan salt is not the same thing, nor is Morton Tender Quick.Mustard is obligatory to serve with this dish. Here in France, I served it with Dijon, but spicy brown mustard in America is good, or you can make homemade mustard. 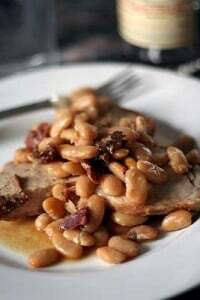 (For a brown version, use dark mustard seeds.) Other options for condiments include horseradish, cornichons and very coarse salt. 1. To make the corned beef, put the water, salt, and brown sugar in a large pot and bring to a boil. 2. While the salted water is heating up, in a skillet, toast the cloves, peppercorns, allspice berries, and mustard seeds, until they smell fragrant. It will take just a couple of minutes. Remove from heat and let cool. Once cool, lightly crush the spices in a mortar and pestle or in a zip top bag with a hammer or rolling pin. (Note: In the photo in my post, because I was so excited to have brisket, I neglected to crush them, which I do recommend to help release their flavor.) Add them to the brine, along with the bay leaves, cinnamon stick, red pepper flakes, ginger, and pink curing salt. 3. Once the brine is hot enough so the sugar and salt are completely dissolved, remove from heat and add 2 pounds (900g) of ice cubes. Put the brine in the refrigerator until it’s completely chilled. 4. Once cool, put the brisket in a large, zip top freezer bag set in a larger bowl. (The bowl is in case there is any overflow or spillage.) 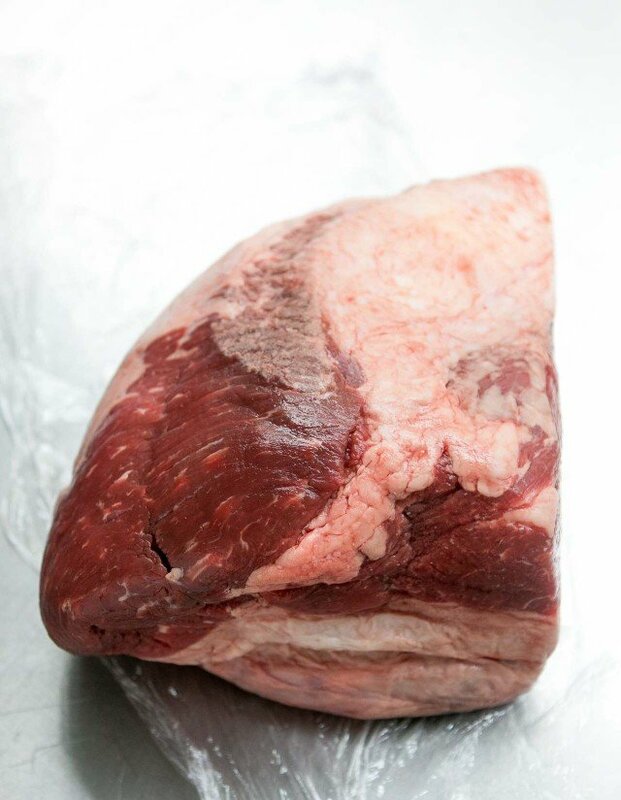 Make sure the beef is lying flat in the bag and pour the cold brine over the meat so it’s completely covered. If you have too much brine, strain out the spices, add them to the meat bag and discard the excess brine. Close the bag and let the meat sit in the refrigerator for 7 to 10 days, turning it every couple of days so the meat marinates evenly. 5. To cook the corned beef, rinse the corned beef with cold water and put it in a large pot or Dutch oven. Add the onion, garlic, and any seasonings, and enough water to cover the beef. Bring to a boil then reduce the heat until the water is at a gentle simmer. Put the lid on the pot so it’s ajar and cook, turning the beef a few times while it’s cooking until very tender. 6. About 45 minutes before the meat is done, add the carrots and potatoes. (And cabbage wedges, if using.) When the meat is tender and the vegetables are cooked through, the corned beef is ready to serve. The meat will take about 3 1/2 hours to cook. Serving: Serve slices of corned beef with the potatoes and carrots, along with some of the broth. Mustard is obligatory to serve alongside. A few condiments are mentioned in the headnote. *Note: I mentioned Baked Corned Beef in the post and I did get around to trying it. (I used a store-bought corned beef to test it.) Because I had heard it produced a saltier corned beef, I brought the corned beef to a boil in two changes of water to desalt it a bit, then patted it dry. In a small bowl, I mixed 1/3 cup mustard and 1/4 cup light (or you can use dark) brown sugar with 1 teaspoon cider vinegar and a few good turns of black pepper. I reserved a few tablespoons of it then smeared the rest over the corned beef. It got placed fat side up on a large sheet of aluminum foil, set on a rimmed baking sheet or baking dish, and closed tightly. I baked it at 350ºF/160ºC for 2 1/2 hours. Then I opened the foil (carefully, as there was hot liquid in it), then smeared the rest of the glaze on the corned beef and ran it under the broiler until browned. The results? I thought it was still saltier than regular corned beef, which may be because I used a store-bought corned beef, but I found it tougher than a simmered corned beef. However it was firmer and easier to slice, so it might be preferable if you were planning to use the corned beef for sandwiches. According to the handwritten notes in the post, one says that you can use tendron, flanchet, or bavette to make corned beef, that is similar to brisket. 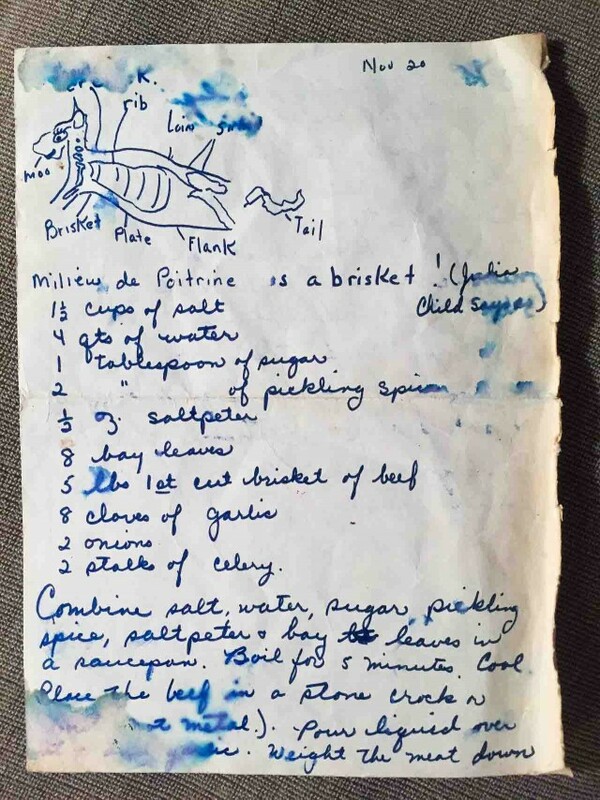 Another says that brisket is milieu de poitrine, according to Julia Child (says the note card), accompanied by a diagram. As mentioned, I used brisket meat from Metzger which was purchased from their professional shop at Rungis, Metzger Frères. Note that my friend ordered a 5 kilo (11 pounds) piece of brisket, which is what they call it, and 5 kilos is the minimum order. (Ours came in a large, cryovac package.) My recommendation would be to call the shop (not the one at Rungis) and see if they can order it for you. Note: You may have to buy 5 kilos. This website gives a good lexicon for French pieces of meat, in French. Although most beef cuts don’t translate exactly from French to English, or vice-versa, Grasspunk has a post: What are the English equivalents of French beef cuts. And Posted in Paris has a series of posts on Making Sense of the Supermarket in France, with a post on Cuts of Meat. For the bread you might try Polish, German or Jewish bakeries in Paris as sourdough rye bread with caraway seeds is traditional Eastern European. Fantastic! This is a dish my mother made often in Australia. Corned beef was a staple in rural areas. When we moved to London there was only one place I knew where to buy it — a Jewish sandwich shop in Poplar. You certainly couldn’t buy lumps of it to make a boiled dinner with. Once or twice we cured our own. Now we live in rural France and every now and then I buy a can of the Spammy stuff, which my husband thinks is a big treat (!) Only the other day we were talking about brining a batch of meat so we could have proper corned beef. Our laitiere has given us a big plastic lidded bucket, so now it’s just a matter of negotiating a piece of meat from our butcher. Hi Susan, lots of the Jewish delis in and around Chancery Lane in London have traditionally done it too. Tried to find corned beef in London with no luck. In the end cooked Danish bacon like corned beef and it was very tasty. Try Brick Lane – and they call it salt beef not corned beef. There’s a bakery on Brick Lane that serves it on a bagel – go figure. But it is delicious. Haven;e seen it uncooked however. Dave……. You’ve just described my lunch at Carnegie Deli… Karma…Karma..
Stefani: I’ve tried some of the breads on the rue des Rosiers bakeries in Paris and while they are fine, they don’t have the je ne sais quoi that the ones I remember from New York, had. Particularly the extra-crispy crust! Ron: I saw they just re-opened ~! I doubt there is a rye in France that could compare to Orwasher’s on the UES! Twice baked rye at the Carnegie and, did you know, Orwasher’s is setting up shop on UWS ?? Orwasher’s is setting up shop at Amsterdam & 81st. Can’t wait.. I used a piece of beef that was labelled ‘bourguignon’ so I don’t quite know what it was. Nevertheless it was very successful, with the right texture and taste. I don’t think I would bother with the beetroot trick again. The meat came out of the brine looking lovely and red, but it lost all of it in the cooking. This looks like what we call salt beef in the UK – which I love too, do you use saltpetre? Is that what the rosa salt is? Just wondering about the saltpetre as it is mentioned in both handwritten recipe?? as Angela asked…is this the same as the pink curing salt? Angela and Issi: I don’t know if it’s the same as saltpetre. Perhaps an internet search will help determine that? I included the label of what I used to help. Yup, no dye needed! It is just added so that people don’t confuse curing salt with the regular stuff. So excited that st Patrick’s is coming up so we can get some corned beef on sale here in the states. I wish we had more freezer space so we could stock up. My husband will also make pastrami in his smoker. He one smoked 24lbs of pastrami for our daughters sandwich birthday party. So good. We haven’t ventured into corning it ourselves yet, but I’m sure we will one day! I had the same thought – I am making a traditional New England Boiled Dinner. I am originally from Boston, but I now live in Jerusalem. Here the corned beef is called pickled brisket. With so many French people here now, it is easy to find Dijon. I like the whole grain version for this particular dish. So funny…I just wrote a reminder to pick up a brisket (siedfleisch in German). Yours looks better, maybe I should head over France and pick one up. I’m near Basel so it isn’t far :-). The taste is the same with out the curing salt, so everyone should try and make it regardless! Anyway, thanks for the second reminder! I love you… I have been trying going on 8 years now to make corned beef in France. Now there are these great like, Little Prince passages so show the butcher. Thank you so much. When I have visited back in the states, I have baked a few corned beefs. It’s good – texture is different to boiled or pressure-cooked. Never did I find mine too salty. The smell does not linger as it seems to with the other methods. In addition to the great post, these pictures are absolutely beautiful — especially the one with the potatoes and carrots that look like they were just pulled from the ground (they probably were!). Gorgeous!! And I love the explanation about the lack of equivalent French terms for “corned”. Fascinating! I look forward to making corned beef! Thanks David for another great recipe. I love your copper pot too! I too, grew up in New England. When my mother made New England Boiled Dinner she used a smoked ham picnic shoulder instead of the corned beef. It is also quite good, and of course, nostalgic for me. But… for St. Patrick’s day, I always use corned beef. This was my experience growing up on Cape Cod as well. New England boiled dinner was a type of ham with cabbage, potatoes and carrots while corned beef and cabbage something different. It was served with our Clancey brother records on the turn table and all 12 of us (10 kids!) wearing green. I grew up on pastrami and still love it. That said, I can’t wait to make this…with cabbage…excellent recipe, thank you! In USA people seem to purchase already cured corned beef complete with the spices and they are always whole not crushed. Also, I couldn’t help noticing the inside of your copper pot is in need of retinning. I have a few pots like that and I’m wary of using them with the copper showing through. Tinning is quite expensive as they charge by the inch. I haven’t checked anywhere about the consumption of copper on ones system.How do you feel about using these pots? Over the last few years, I’ve corned oxtails, beef ribs, cheeks, chuck and round. They’ve all turned out good to great, but the fattier the cut the better. P.S. Corned cheek hash was off-the-charts great! Here in the UK we only know the tinned stuff (you can also buy slices in those plastic packs, like sliced ham); my husband dislikes it, so I never buy it, although I like it. I had not been aware there was any other kind until a trip to the USA some years ago, but I believe here it is called salt beef. Incidentally, to our American friends – its central role as a meal for St Patrick’s Day is, in fact, an Irish-American tradition. The Irish eat bacon, but apparently couldn’t find it in New York when they arrived there (well, duh, their Jewish neighbours would be rather unlikely to stock it! ), so made do with what they could find, and thus a new tradition was born! Actually, it wasn’t just that they couldn’t find bacon easily in New York, but that what they could find was prohibitively expensive (for poor Irish emigrants, anyway). This is such a wonderfully ironic story! Thanks for the history! A & J Meats in Seattle made wonderful corned beef – starting with first rate beef brisket, of course. Unfortunately, when Rick decided to retire, I didn’t have the nerve to ask if he would share his recipe. Their method of cooking was to use a slow oven, placing about an inch of water in the roaster, meat fat side up. Cooking time was 3-4 hours total with the pan sealed with foil. After an hour, they had you pour off the water and replace it with an inch of “clean” water. An hour before serving potatoes and carrots were added. They did not include cabbage. Changing the water eliminated a salty taste while preserving the flavor of the spices. Many years ago, mother’s trick for avoiding the cooked cabbage smell was to remove the meat, potatoes, and carrots, bring the water to a high simmer and add cabbage just long enough to wilt it. Now I’ll be ready to try my own, and plan to this year…followed of course by a scoop of perfect ice cream on almond cake for dessert. Thanks! I think next time, I will try baking it. Since this particular hunk of meat was precious, to say the least (! ), I didn’t want to mess around too much. But since I have a lot of curing salt left, I may need to order a whole 5 kilo slab for myself, and freeze it in smaller portions, and brine another one. Some people bake it with a layer of brown sugar on it, but good tip on changing out the water. I didn’t make it clear that the roasting pan is covered and sealed with foil. Might not be obvious! Roasting the cabbage…great idea! I’ve baked mine for years. Rinse the excess spices and slime off the brisket, crosshash cut the fat layer like you would a ham, add freshly ground pepper and place on a rack in a shallow pan, fat and pepper side up. 300 degrees F for three hours. No water no foil cover. Let rest to redistribute the juices then slice. Overnight refrigeration allows you to slice ridiculously thin for that deli pile look. Obviously saltier than a boiled brisket but more like a cross between beef and bacon without the giant pink eraser texture from boiling. I’m surprised to hear from UK readers that they call non-tinned corned beef salt beef, as my English mother and grandmother made this and called it corned beef. Perhaps the term has now died out. Tinned corned beef is enormously popular in the islands of the South Pacific, alas to the detriment of health there. In Australia it is traditional to served corned beef with a white sauce with parsley but I love having it with a salsa verde. Perfect. Mustard sauce(made with some of the cooking liquor) is my favourite when having hot corned beef. Corned beef boiled with cabbage, carrots and potatoes is a traditional meal here in New Zealand, where I live. It’s a firm family favourite. We usually serve it with parsley sauce and hardly ever have left-overs. It’s readily available at the local butcher or supermarket to cook at home, but I’m looking forward to trying out the curing process myself. Thanks David for another delicious sounding recipe, that makes me want to head to the kitchen. Rye bread with seeds and good corned beef is perfect for the day after the “New England Boiled dinner” But always leave some…Left over for Corned Beef Hash is a must. Thanks for another great recipe and this will go on the “menu” for this weekend. I have a taste for a good corned beef sandwich or a Reuben. David, this is the way I cooked corned beef for years and one day when buying my meat at Market House Meats in Seattle they gave me the cooking instructions. Cook in the oven in a covered pan with only about an inch of water at 300 degrees F. for 3 1/2 to 4 hrs. Absolutely the best way to do it and I’ve never done it boiled on the cook top ever again. I usually add the 4 wedges of cabbage into the pan for the last 30 mins. I do my potatoes and carrots on the stove top though. You should try this method and see what you think. My whole family does it this way too now. Cheers! 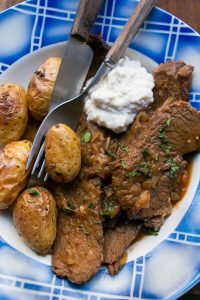 This is very similar to a recipe I make in Greece but of course we cannot get hold of the Saltpetre and of course we cannot get a brisket – the cuts are so different. The ‘corning’ or curing makes all the difference. I’m going to try your method which calls for a wet or cooked marinade whereas the method I’ve tried earlier is a try rub and left in the fridge for 7 days. Thank you for the Pink Salt idea!! Perfect. Hi Marsha: Thanks for the links. The one from Serious Eats is a dry brine, but takes the same amount of time (7 days) and requires 10 hours of cooking, either sous vide or in the oven. Someone gave me a sous vide machine but I haven’t tried it. Maybe I will (finally) unpack it and give it a go! 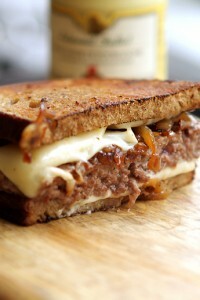 My husband wants to make his own corned beef and you’ve just inspired me to make it happen! I have never made corned beef, this recipe is a keeper. You can get brisket from the Jewish butcher on Rue des Rosiers (and they also have the best mergez in Paris). Love this post!! I boil my corned beef, then slice, cover with yellow mustard, brown sugar and a bit of cloves. Bake in the oven until the brown sugar melts. Completely untraditional but delicious!! I have made corned beef tongue. Since it’s a smaller piece of meat, you don’t need to brine or cook it as long. I didn’t know what to do with the skin, so I left it on for brining and cooking, then sliced it off when done. Leave the skin on but stab the tongue all over with a skewer or a paring knife before brining. Is it customary at French farmers’ markets for carrots to be sold dirty? I’m accustomed to seeing young potatoes sold dirty to avoid damaging the skins, but I think that’s the first time I’ve seen the practice applied to biggish carrots. Always interesting to see how/why customs vary. 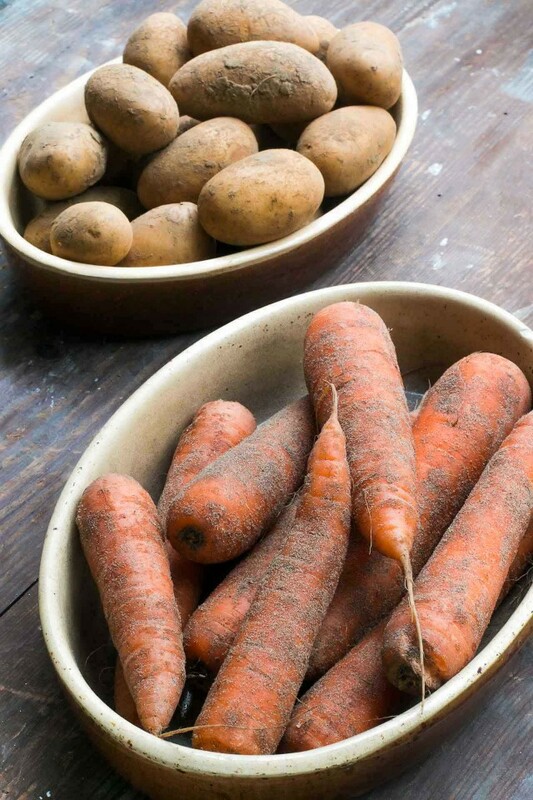 They’re called carottes de sables which are said to be less-bitter than standard carrots because they are grown in sandy soil which allows for better drainage, making the carrots sweeter. They are always sold with the sand on them to prove their provenance. You can read a bit more about them here. I enjoyed this so much! I recently had the most delicious corned beef at a farm-to-table symposium dinner. I am not a big meat-eater at all, but corned beef is absolutely my favorite, also. And on good New York rye bread – the best!! I’m inspired! I started corning my brisket today and looking forward to something better than a store bought one. 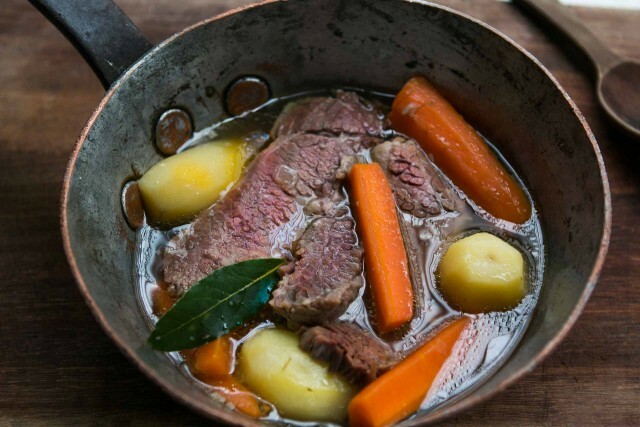 Very Irish-Australian dish, and terrific when cooked properly – thank you, David, for the recipes, links and other information. Unfortunately when I was a kid many butchers here prepared a ghastly version of “corned beef”, a slab of cheaper, fatty meat rolled up and fastened with wooden skewers. That’s what my immigrant Irish-Australian grandmother would cook, it was horrible. I hated corned beef until my mother-in-law took up the challenge to show me what proper corned beef could be, with brisket. Of course I loved it. Same story with roast beef, older Australian readers my remember – or choose not to. Corned Beef was on the menu once a week when I worked as a cook in outback Australia (East Kimberley). I used to get delivery once a week; the closest shop was two hundred kilometres away. I cooked at least 10 kg at a time. I wash them and put in similar spices to what you use to corn the beef with but one exception: whole lemons stabbed with a skewer, all over (good way to de-stress). I set them on the stove with onion and carrots and potatoes and let them poach in barely simmering water(no bubbles). The meat holds together and slices beautifully, the vegetables don’t fall apart. It’s the ultimate comfort food; thanks for writing about it. There is plenty of already corned beef for sale in US but I prefer grassfed and not paying extra for water, so your delicious post is inspiring me to corn my own. Any chance you can confirm salt quantity? When I weighed out 310g it looked like a lot so I put into measuring cups it was closer to 2.25c. Which is correct? This looks absolutely divine. Amazing work!! Well, gosh, I think I need to make this. I don’t know if my French husband likes it or not. I loved all the photos but that drawing of the cow just got me-little tail floating off to the side, the “moo”-very cute. Looks lovely, Dave! Going to give it a try. I’ve always used a crockpot to make homemade corned beef, I find it much easier and the quality of the beef after is just perfect. Have you tried it? Thanks for sharing your recipe. I used to go for corned beef in Schwartz’s Deli in Boul St-Laurent, Montreal. Is curing salt really necessary? I’ve got the brisket and all the other ingredients and have no idea where I’d find it at this stage. Aidez-moi! No, it’s not. 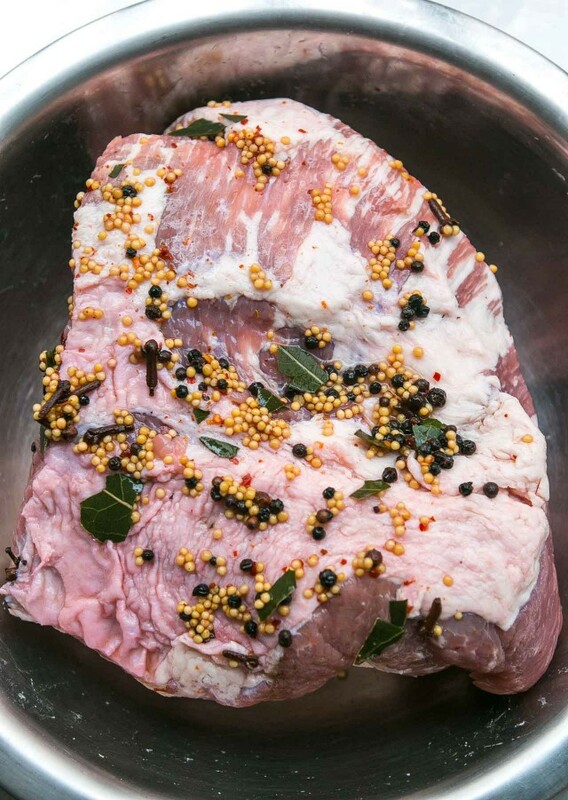 I did mention in the post “You can make it without, although the corned beef will not look like traditional corned beef.” I also noted that in the headnote at the start of the recipe, that the curing salt isn’t required and you can omit it should you wish. Thanks so much for your quick reply. Onward and upward with the recipe. BTW, I bought the brisket at an artisan butcher shop here in the US. One of the hipster butchers showed my the brisket they have for sale already brined and it looked exactly like your photo, mustard seeds and all. Thanks for the link. That’s an interesting premise about the celery juice, which they say acts as a similar preserving agent to the pink salt (which they agree is primarily added to keep the red color in the meat), but the picture in the article shows a very red corned beef. They do offer up pink salt as an alternative to the celery juice but I wonder why it looks like they didn’t use it for the corned beef that is shown in their post, that accompanies their article? I agree with you that the picture looks awfully pink, but I assumed that the celery juice was quite potent then. In any case, those “nitrate-free” meat products use celery powder or juice which really irritates me because the product is NOT nitrate/nitrite free. It just doesn’t use pink curing salt. Same chemical, different form. But I also take issue with the paranoia with nitrates/nitrates. It’s a naturally occurring chemical in vegetables (vegetables!!!) like celery and spinach. Celery has more nitrates than a hot dog and I haven’t read anything yet that showed people or rats getting cancer from eating celery. Beside retaining the color of cured meats, the nitrate gives the meats a certain flavor (Michael Ruhlman discusses this in his Charcuterie book and blog), AND it keeps botulism at bay in these cured products. As with everything, enjoy in moderation and you should be fine. Yes, nitrates are naturally occurring in vegetables. I don’t like “adding things” unnecessarily to food, but with corned beef, I do like the red/pink color. I tried to do a Google image search for “corned beef celery juice” thinking I could find an example of it elsewhere, but didn’t. I think it’d be interesting to try and see if the color was, indeed, the same. I don’t have a juicer though. But if anyone out there does try it, I’d love to see the results. This reminds me a lot of Swedish “Kalops”, which is basically the same ingredients! It looks really delicious, and now you’ve made me hungry, haha! I made this over the past week, following the directions almost exactly and it was DELICIOUS. In the end we braised some cabbage separately and added it when serving for corned beef and cabbage. I was so nervous to put so much time into a (relatively, for me) expensive cut of meat but in the end it was completely worth it. I haven’t read all comments, so hope I’m not repeating another. I think there may be an error in the weight for the amount of Kosher salt. I think 1-1/2 cups is 168-170 grams. I prefer to measure by weight in metric units, so would like to be certain I am right! I use sea salt and since this question came up before, I took a snapshot of the 1 cup of salt on my scale. Like all ingredients, salt can vary (perhaps even more so due to crystal size and humidity). But I’ve seen recipes that use up to 2 cups of salt in a similar brine but mine clocked in at 1 1/4 cup. So you can use the volume measurement rather than the weight on this one. David, I used Kosher salt and now after an earlier reply I’m worried about botulism. Am I being a worry wort? Am not sure what the previous comments you are referring to are. The meat is not long-preserved (even fresh beef can normally be held in the refrigerator for 7-10 days without problem) and botulism is killed during the cooking if it is present. The pink salt is a conserving agent as is the salt. The amount of salt in this recipe is similar to those of Alton Brown (1 cup kosher salt), Martha Stewart (1 cup salt), and Michael Ruhlman (1 1/2 cups). The “B” word was mentioned in the comment posted regarding nitrates. Thanks, now I can get rid of the mental images I had of people in various stages of food poisoning after the meal! When I have customers that want to do pastrami or corned beef I ask the butcher to cut the “pointe de poitrine”. I’m in SW France and that’s what they use here. The whole poitrine on a French cow would be huge! Awesome stuff! Thanks for the link to my farm blog, too. Just have to say I made this for St. Patrick’s day last night and oh my- it was phenomenal. 5 lbs was gobbled up quickly by our group of about 8 people, and everyone said it is the best they have ever had. Even the potatoes and carrots were heavenly. For anyone looking to make it in a slow cooker- I put the beef in fat side up on top of the garlic and onions, covered in water, threw in bay leaves, peppercorns, mustard seeds and a few cloves. I cooked it on low for about 8 hours, then added potatoes and carrots and cooked for another 3 hours or so. We added cabbage on top for the last 30 minutes. I think after this, corned beef is going to have to be more than once a year now that I’ve seen how good it can be!! I agree with Eileen. It’s amazing how so few humble ingredients can push all the comfort food buttons and not be bland or boring. The brisket and vegs were meltingly tender and the broth brought a delicious, and subtle flavor imparted by the spices from the brine. Yes, this is definitely a meal that should be made more than once a year! David! I made this for St. Patrick’s day and it was delicious. We’re in the process of moving so I’m trying to use up the meat in my freezer; I used a chuck roast. Still amazing! Thanks for sharing your recipe. I like the diagram of the cuts of beef. The moo comes out the front and the tail comes out the back? Interesting.